One of the basic exercises in parapsychology is “invocation,” the calling forth of a spectre from a divine source. Sometimes, invocation can happen accidentally. Playing with dowsing rods in a cemetery, for instance, is generally not a good idea. As it turns out, visiting The Official Site Of The WWE Universe during normal working hours can have a similar effect. The week of August 3rd was a particularly slow one. All my coworkers were out of the office, and come Tuesday I had finished all the work they left for me. Being the huge pro wrestling fan that I am, I immediately went to The Official Site of the WWE Universe to burn some time. If only I had known in advance the grave mistake that would be. When the website loaded, all the power in the office went out. All the power, that is, except for my computer, which started playing John Cena’s theme music at full volume. As the horns blared, I mashed the computer’s mute button to no avail: each press opened 10 tabs in Chrome of the same picture of John Cena yelling and wearing jorts. I lunged for my computer’s plug and yanked it out of the electrical socket. The music stopped, my computer shut off, and the office’s power came back on. I walked to the office’s IT technician and asked him if he could take a look at my computer to determine what was wrong with it. He sat down at my computer, turned it on, and, while it was booting up, asked me to explain exactly what the problem was. I told him what had just happened and he started laughing. 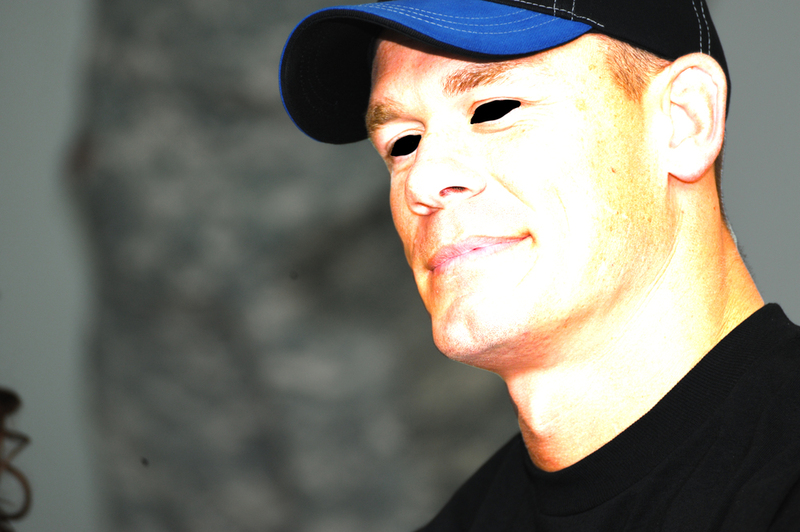 When a giant, demonic version of John Cena’s face appeared on the screen instead of the login page, however, all the color disappeared from his face. I believe his last words were “It’s possessed!” before the computer wrapped its mouse cable around him and threw him out the fifth-story window. It’s been two weeks now, and the work is piling up. I’ve been told to make spreadsheets, plot data, and type reports. I can’t do any of it. The only numbers Excel allows me to enter are the years John Cena won one of WWE’s Slammy Awards. Any graph I try to make just ends up being a horizontal line with “John” on the x-axis and “Cena” on the y-axis. Whenever I save a Word document, all the writing gets replaced with the words “You Can’t See Me” written over and over again in pink 64 pt Marker Felt font. The only webpage I can access is John Cena’s WWE bio. My computer login and password are both “John Cena”. My email address was changed to “JohnCena@John.Cena”. My wallpaper is John Cena. My cursor is John Cena. Somebody call an exorcist, please. Aug 23 This Fan Theory Proves that the Insane Clown Posse and The Big Bang Theory Exist in the Same Universe!